Yep. I name my zits. Find out all about it at Blissfully Domestic. All the blotch without the breath. I name them, too! Mount Vesuvius is one of my most common companions. My girls call them “zips” but I think I need to name the current one on my chin. It’s a whopper! p.s. You are still pretty…zits and all! Ha! I named mine Nora. No idea why. Still, I don’t notice the zits because I’m too busy wondering where I can get frames like yours – cool specs! calicobebop’s last blog post..Guess what – I’m not remotely like Tyra Banks. Oh well! 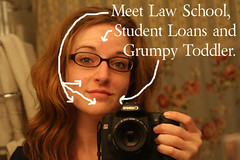 I have the student loans one too but prefer to think of it as a beauty mark. I don’t name mine because I don’t want to give them the impression that they are love and cherished and welcome to stay. They are not. But look how sharp they look with the new camera! That’s not helping is it? I love you even more. And that’s a lot. kristi’s last blog post..Mary’s first sentence! Ha ha. You are gorgeous – zits and all. Odd? yeah, but I would rather have PMS zits than be pregnant at this point. staciesmadness’s last blog post..YEAH, I got ‘em. Funny how despite them, you are still COMPLETELY ADORABLE. Ha! Wait until you have three children, a husband, a graduate degree, gray hair, puffy eyes, wrinkles AND zits. Dare to dream, I say. Liz’s last blog post..Meet Steve. I still have issues with my skin. I’ve been on ProActiv for nearly a year now. And while it’s made a HUGE (capslock warrented) I still don’t have skin the the commericial people. Although I don’t have a makeup team either…. Jill’s last blog post..An Amazing Day or How many pictures can I put into one post? I totally do the same thing! Who doesn’t? Shannon’s last blog post..The Prize – Enter Now! If I were a lawyer, I’d name my zit OBJECTION! Yeah, but you’re STILL cute.